TAMPA - In Florida, homeowners’ associations can foreclose on homes when owners don't pay their dues…sometimes for as little as a few thousand dollars. “It was a little over 1300 square feet. There's a half bath on the bottom floor and two full baths on the main,” said Chelcie Miller, describing her former Carrollwood Rental townhome. “I feel like we've been betrayed,” said Taveras. We met the Taveras family as they packed up to move. “We were supposedly on the premises illegally,” said Christine Taveras, Jorge’s wife. In four years, they paid more than $62,000 in rent, never missing a rent payment. But in March, a new landlord claimed ownership of the property, while the company they signed a lease with continued to expect rent payments. They were caught in the middle and ended up being evicted. “They upped our rent. They said they need all the security deposits back,” said Miller. Chelcie Miller and her husband were given five days to pay $1,800 or move out of the townhouse they rented. They had already paid that month’s rent when they got the notice. “Send us a check to a PO Box. Don't fill in the name, just put the amount and day and sign it,” Miller said she was instructed. Their new landlord, convicted felon Barry Haught, has filed eviction cases against more than two dozen tenants since March, even though he doesn't actually own any of the properties. Haught and a former partner bought titles to 120 homes for as little as a few thousand dollars each at HOA foreclosure auctions. After they had a falling out, Haught used quit claim deeds to transfer the titles into new companies, then demanded new leases, new security deposits and rent from tenants. “There's a lot of houses. A lot of families are getting kicked out because of this. And a lot of people don't know about this,” said Jorge Taveras. It was not the first time Haught was tough on renters. In 2011, he was arrested, convicted and spent time in prison for trashing a renter's home while he was trying to evict her. According to a police report, he damaged a television, a DVR and a Sony Play Station. He told officers “I just wanted my seriousness understood." Previously, he served federal time for Medicare and Medicaid fraud. He served 4 ½ years after he was convicted of that crime and was ordered to pay $14 million dollars in restitution to the U.S. Government. Now Haught's companies advertise properties for rent on sites like Trulia and Zillow. Court documents show Haught's new companies bring in more than $62,000 a month in rent. The majority of the revenue is profit, since investors are not paying for mortgages, insurance or taxes on those properties. The companies are operated out of a sports marketing office in west Tampa, where we observed a steady stream of investors, employees and attorneys come and go. We tried to talk to Haught as he was leaving, but he drove away. We also reached out to his attorneys by phone and email, and visited Haught's home, but no one responded. 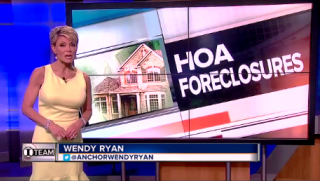 “There is no requirement imposed on these investors to place language in a lease disclosing the fact that these properties are in foreclosure,” said Attorney Ryan Torrens, who has represented multiple parties in HOA litigation. 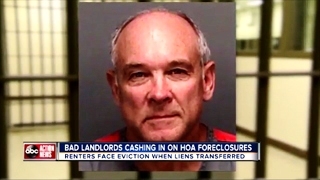 Torrens says HOA foreclosure renters often don't know what they're getting into. And when banks finally foreclose, they are only required by law to give occupants a 30 day notice to vacate, whether or not they have a lease. “The tenant should be informed that there's a possibility that you may have to move because this is still owned by the bank. Tenants and experts say future renters should protect themselves by asking the right questions before they sign a lease. “We should have information about the company, how long they've owned the home, if this home has been in foreclosure. We're supposed to have protection and we don't,” said Jorge Taveras. Homeowners should started by looking up addresses on a property appraiser’s website.